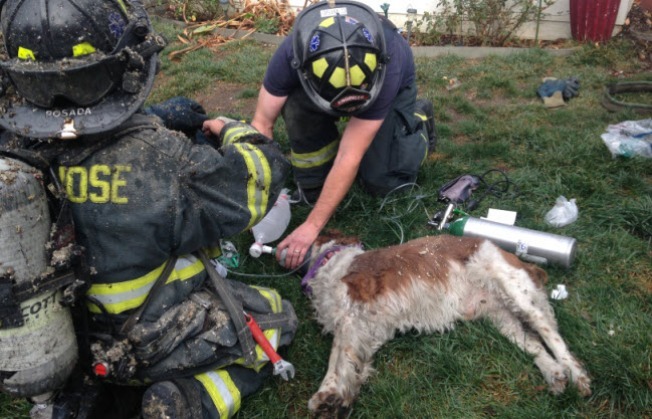 Firefighters perform CPR on a dog after responding to a mobile home fire. A woman was taken to a hospital, a firefighter was injured and medics performed CPR on a dog stemming from a Thursday morning 2-alarm mobile home fire in San Jose. San Jose Fire Capt. Cleo Doss said the firefighter's injuries were not initially considered that serious; he fell through the floor inside the trailer home. Doss said that after performing life saving measures on the woman, they were able to restore her vital signs, but she was taken to the hospital in critical condition. As for the dog, firefighters were able to get "light respiration" from the pet, though he was initially in critical condition, too. "We're trying to bring him back," Doss said. The fire was first reported at 417 Los Encinos Avenue about 11 a.m. The cause is under investigation.